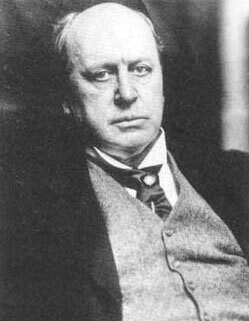 Henry James was born in New York City on April 15, 1843. He was the first American writer to envision his vocation in global terms. He desired to be a literary master. His recognition however did not come into its glory until the time between the world wars. Henry's father was an unconventional, independently wealthy philosopher and religious imaginative. Henry's older brother William was the first American psychologist of notable status. He was also a very astute and influential philosopher. Henry had two younger brothers and a sister. Henry James went to Europe as an infant and then back to the States where he lived in New York City until age 12 and then the family again left for Europe. James' father was desirous for his children to have a rich and luxurious education. For the next four years, James' family lived in England, Switzerland and France. Henry James and his siblings were constantly exposed to museums, libraries, theaters and art galleries. Henry's time abroad gave him a mastery of the French language suitable enough to get him started in the study of its literature. Three of James' earliest book were: "A Passionate Pilgrim," which is a collection of stories; "Transatlantic Sketches," which is a collection of travel articles; and "Roderick Hudson," which is a novel. All three of these works were published in 1875. In 1877, Henry James published "The American." This was James' first literary success followed by his first work that earned him widespread popularity, "Daisy Miller," published in 1878. "The Portrait of a Lady" was his first masterpiece which brought him international recognition. His focus for this work was his cousin, Mary Temple, who died at the age of 24 of tuberculosis. This work, for the first time in any of his works, delved into the complexity of the inner life of his characters. Other works by James written in these years include: "French Poets and Novelists", 1878, "The Art of Fiction", 1884, and "Partial Portraits", 1888. Over the years from 1885 to 1890 Henry James was mostly concerned with the writing of three novels: "The Bostonians", 1886, "The Princess Casamassima", 1886, and "The Tragic Muse", 1889. These works of James' were not to be appreciated for their merit until after his death. James, who never really became a rich man, did become desperate to provide a living and between the years of 1890 and 1895, he wrote seven plays. Only two of them were produced and neither was a success, so he gave up the desire to be a playwright. Therefore Henry James turned back to fiction. The next few years were to find him experimenting in shorter works with dominant subjects such as ghosts and apparitions, troubled writers or doomed and threatened children. "The Real Thing" was a captivating piece of work for James and "The Turn of the Screw", written in 1898, portrays an entire household, including two children, terrorized by ghosts. James was to go on over the next few years to write many other works, which include: "The Wings of the Dove", 1902, "The Ambassadors", 1903, "The Golden Bowl", 1904, "The American Scene", 1907, "A Small Boy and Others", 1913, "Notes of a Son and Brother", 1914, "The Middle Years", 1917. Henry James always believed in himself and continued nurturing his talent as a writer. It has been said of him that when he was not writing, he was writing about writing.